Enjoy our comfy 1 bed flat with uninterrupted water views from the comfort of the living room. An ideal base to start your Cardiff adventure with the best of Cardiff all within walking distance: Wales millennium centre, Millenium Stadium- Rugby, Motorpoint Arena Cardiff The Doctor Who Experience, Mermaid quay restaurants & bars as well as Cardiff castle. 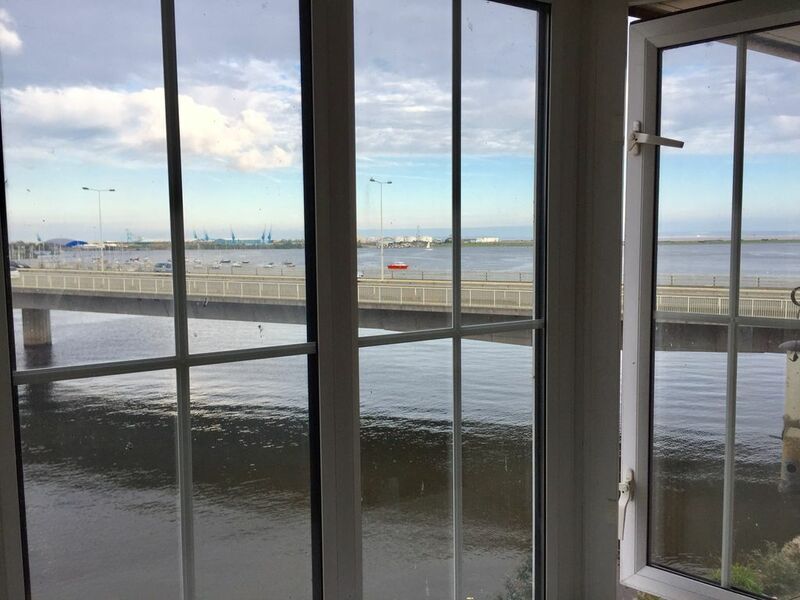 - Amazing uninterrupted water views from the living room. Broadband, access details provided in a folder at the property. Well equipped flat in riverside location. Flat very clean and tidy with thoughtfull additions (a welcome pint of milk so we were able to have a cup of tea after along journey). The flat was in an ideal location for us to attend our daughter's graduation at the Millenium centre in Cardiff Bay. Would be ideal for a couple as large double bedroom and quality bedding provided along with hair dryer and plenty of sockets for electrical equipment. Lounge/dining area of a generous size with fantastic view over the estuary. Kitchen area very well equipped with a range of appliances. Overall a great flat, a little small for 3 adult but comfortable for our stay of 2 nights. Perfect for a stay in Cardiff. Lovely flat. We had a weddding in Cardiff so well located. The flat was perfect it's milk and fruit on arrival. Next to Asda for shopping and food outlets. Free Parking. Near Ikea. I brought my mum to Cardiff for Mother's Day weekend and stayed here for 2 nights. The flat was immaculately clean and very conveniently situated to visit places like Penarth and Mermaid Quay. The owners were on hand if we needed anything but everything was lovely! The bed sheets smelled lovely fresh and clean. My mum stayed in the bedroom and said the bed was very comfortable. I stayed on the inflatable bed in the front room and was surprised with how comfy this was. The shower was also lovely. Can not say enough good things about the experience, We have said we will be definitely be coming back soon! Thank you so much, Vicki! Glad you had a wonderful stay and you are both welcome back anytime. We had a great long weekend exploring Mermaid Quay, taking a boat trip up to the castle area and visiting Penarth. There are great walks all around the flat - you can leave the car - or it is right by a main junction to get to the coast. The flat is very nicely equipped & done out, comfortable and warm. The lounge with kitchen off it creates a good feeling of space, and the table by the window was great for watching the world go by. The large TV with Sky kept my husband happy as the rugby was on! Our adult daughter slept on the air bed and said it was comfy. The bedroom had loads of hanging and storage space and the bed was very comfy. The couple who own the property were very helpful when we had a minor problem and fixed it immediately. Overall, one of the best flats we've stayed in. We had a nice stay in a well equiped, clean appartment. Close to supermarkets and busstop.